Ahti Henla has produced a fascinating mashup that allows people to view the density of Panoramio images across the planet. The patterns in his visualisations look remarkably similar to the geographies of content in Google and Wikipedia that we have previously mapped out. Head over to Ahti's site for the interactive map, or play with the KML file that he has also usefully made available. Although it's been quite a while since we last posted our metro-level cyberscape visualizations, we figured that now was as good a time as any to bring them back. In some of our previous posts, we mapped the total number of user-generated Google Maps placemarks in our sample cities, along with some Crescent City culture-specific maps of New Orleans for Mardi Gras and other interesting examples from around the world. 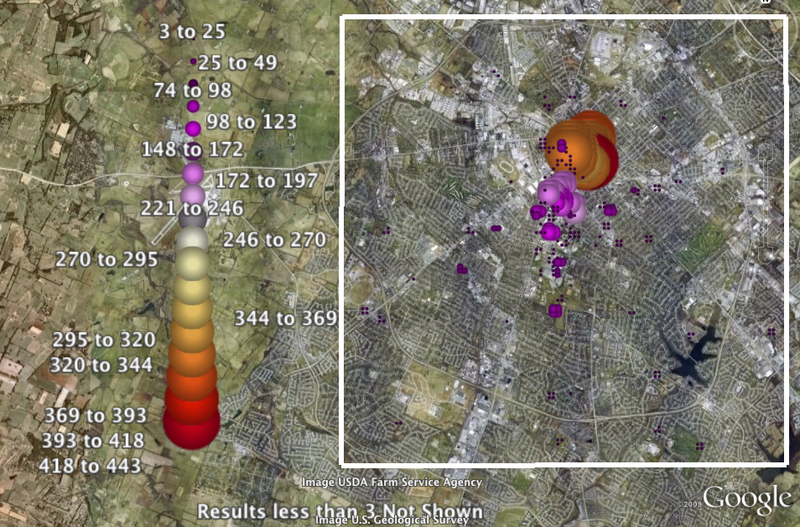 Below you'll find maps depicting the location of all user-generated placemarks (using the keyword "1") and placemarks referencing "crime" in Lexington, Kentucky. Although Lexington doesn't hold much, if any, significance for most of our readership, it presents an excellent opportunity to ground truth these virtual references by comparing them to our collective experiences as current and past residents of "the Horse Capital of the World". 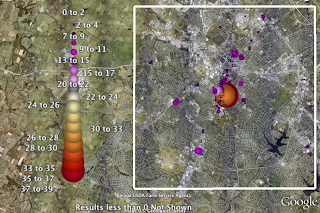 In the first map, the highest concentration of placemarks exists in downtown Lexington. More specifically, the points with the most placemarks (shown in red) are at the intersection of Limestone and Main Streets, a primary intersection in the city and the site of Phoenix Park (formerly the Phoenix Hotel) and the city's courthouses. 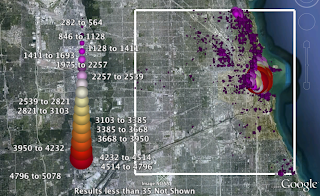 While the spatial pattern of all user-generated content is not surprising in the least, and largely mirrors what has been seen in other urban areas, the concentration of placemarks referencing "crime" is significantly more interesting. 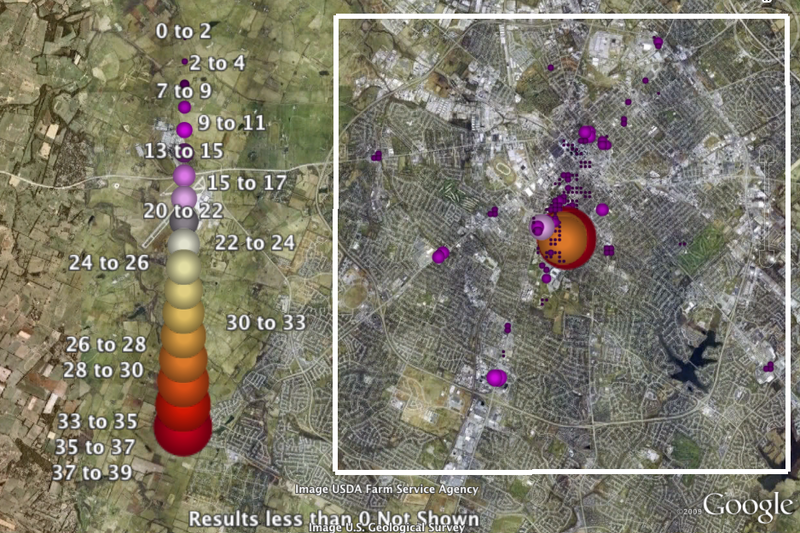 Rather than being a mirror of the more general pattern focused on the city center, placemarks referencing crime are focused on the Kirwan-Blanding residential complex on the University of Kentucky's South Campus. 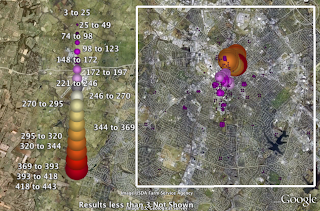 Although this concentration isn't necessarily surprising, given the fact that the Kirwan-Blanding complex has been the site of some significant violent crimes, along with almost innumerable incidents of public intoxication and drug possession, this does represent an important deviation from common patterns of concentration within city centers, as was evidenced by the map of all placemarks in Lexington. 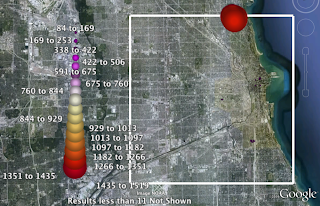 We wanted to use this post to draw attention to an interesting project that maps anonymous Wikipedia edits in almost real-time. 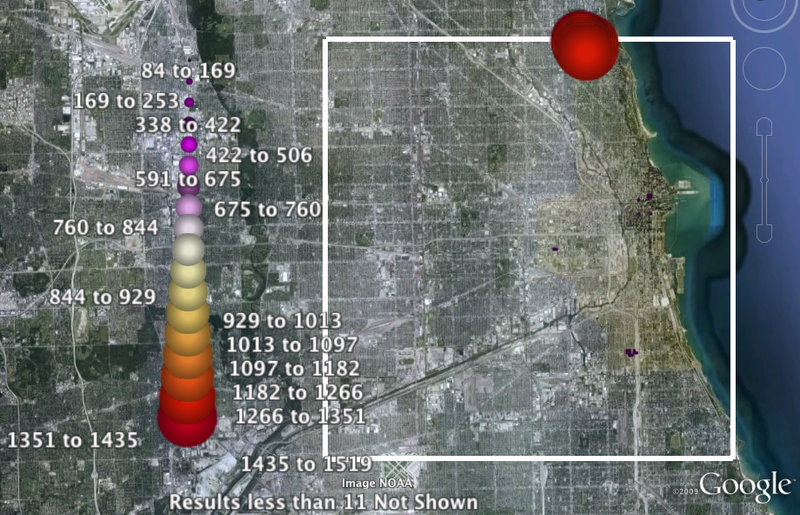 The project extracts data from Wikipedia's recent changes page, geolocates the IP addresses and plugs everything into the Google Maps API. So, for example, in at the moment the screenshot below was taken, somebody in Newcastle, England was editing the rather extensive article on the list of Desperate Housewives characters. Be warned: you can spend a long time being mesmorised by random Wikipedia edits flashing around the world. Why in the world isn't Floatingsheep on Facebook? Until yesterday, this was an excellent question. 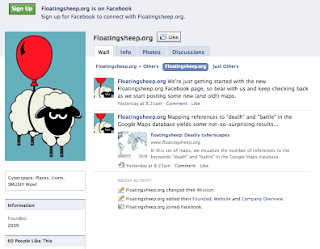 But now Floatingsheep is on Facebook and we'd like you to join us. If you're not already getting enough in the way of fun maps via Twitter, RSS, email subscription or constantly checking in to see when there is something new, Facebook will be just another avenue through which you can connect with the Floatingsheep Collective and give us feedback on the maps that we make and the conclusions we draw from them. 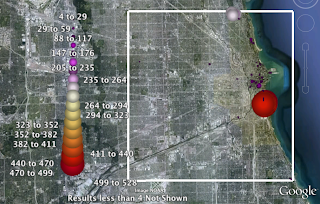 In this set of maps, we visualize the number of references to the keywords "death" and "battle" in the Google Maps database. Unsurprisingly, there is a strong correlation between the number of hits for "death" and "battle" around the world. Much of North America, Africa and the Middle East contain a relatively large number of references to both terms. Perhaps the most obvious example is Iraq, which contains the most references to both keywords. This is undoubtedly related to the ongoing military occupation of Iraq by the US military. 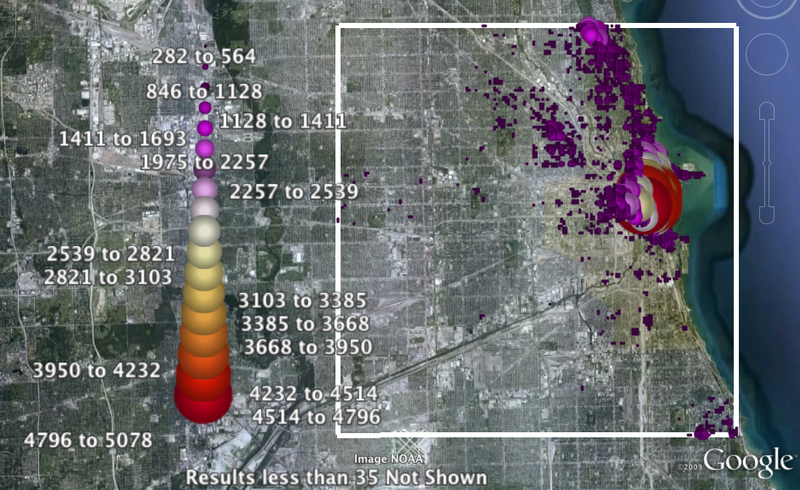 There are, however, other factors influencing the distribution of references to these keywords. Despite being the sites of the Rwandan Civil War and the First and Second Congo Wars (each of which had much higher casualty figures than the Iraq war), both Rwanda and the Democratic Republic of the Congo have a lower number of references to each of the terms. These maps show that the geographies of specific terms are not necessarily representative of lived experiences everywhere. 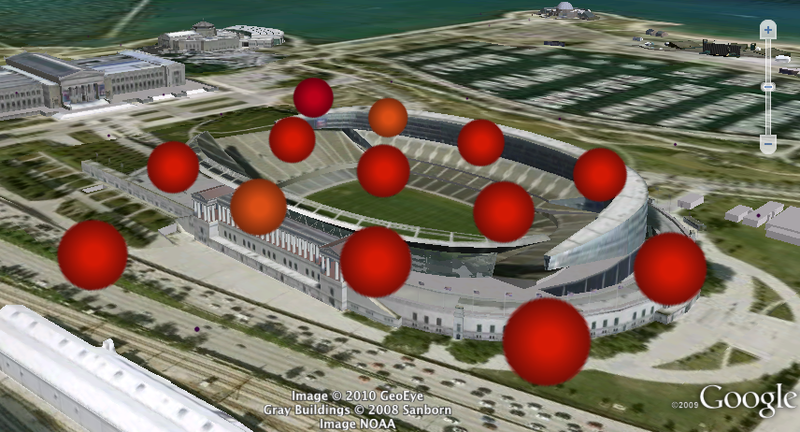 The virtual sphere offers voice to some, but ultimately still leaves out many important stories and representations. In anticipation of the upcoming election in the UK, we have decided to explore the geographies of election-related references in the British Isles. The map below visualises which of five political parties contain the most references at any particular location in the Google Maps database. First, a brief note on method. 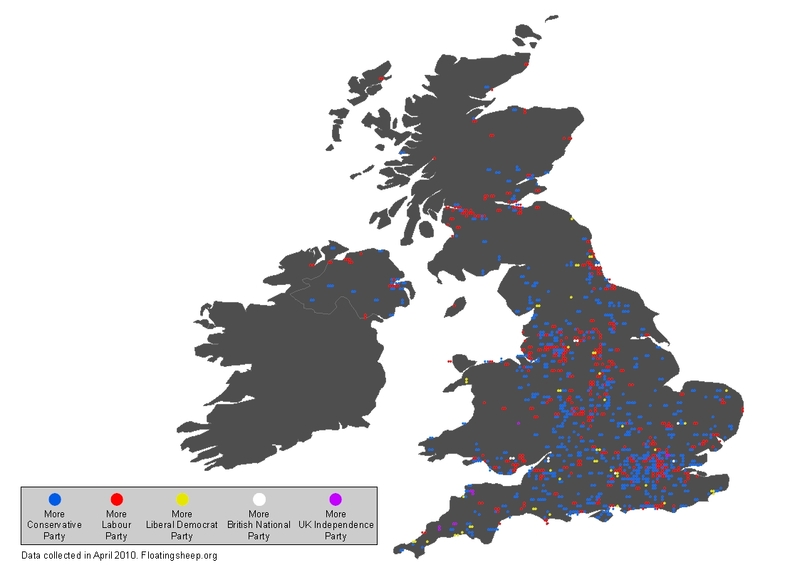 We searched for the three major political parties (Labour, Conservatives and Liberal Democrats) at each location, as well as two of the parties on the far-right of the political spectrum (UKIP and the BNP) that have made gains in recent years. We also searched for the terms "tories + election" and "lib dems + election" and assigned a dot to either the Conservatives or Liberal Democrats if either one of those terms had the most hits at any location. 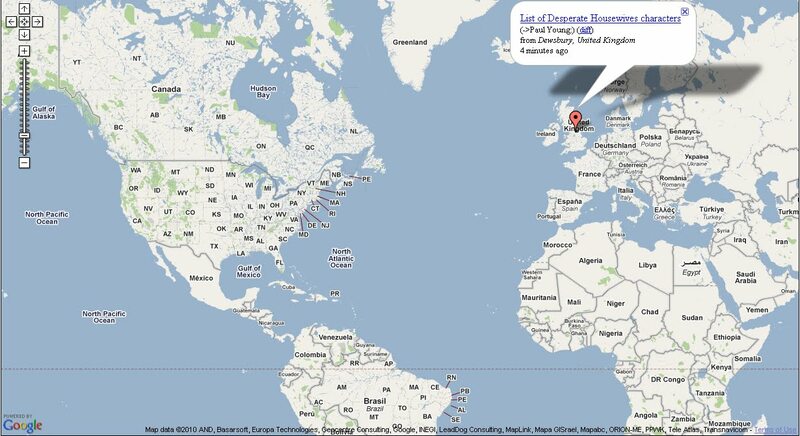 The map reveals some interesting online political geographies. The Tories score better than any other party. In fact, 61% of locations possess more references to the Conservatives than any other political party, whereas 33.8% of places have more references to Labour and only 3.4% for the Lib Dems. The UKIP has a particuarly strong showing in the South West, with multiple points that contain more references to "UKIP" than any other party. The BNP do best in South Wales, West Gloucestershire, West Yorkshire and South Tyneside. One of the most interesting aspects of the map is the degree to which it diverges from maps of likely voting patterns of constituencies. Some of the differences can likely be explained by the relatively recent boost in the polls to the Liberal Democrats (which hasn't yet had a chance to be reflected in material indexed by Google Maps). The strong showing by the Tories could also perhaps be attributed to a greater degree of online engagement by that party. Another way of gauging online popularity of political parties before the election is to search for the names of each party leader throughout the country. Here we again chose the leaders of the three main parties, as well as Nick Griffin (BNP) in order to explore whether this method can tell us anything about the popularity of the far-right in different parts of the country. 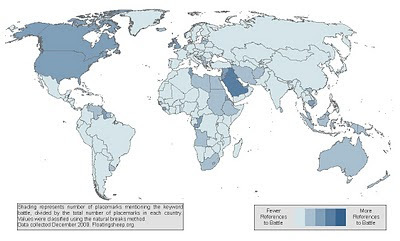 The map below shows these results. Here we see that Labour's Gordon Brown outperforms his rivals in almost every part of the country, a fact that likely owes much to his current position as Prime Minister. The only significant anomaly seems to be a large number of references to David Cameron in Oxfordshire. Nick Clegg and the Lib Dems again show poorly in this map, although it will be interesting to see how the online visibility of these figures changes after the election. References to Nick Griffin unsurprisingly appear in many of the same places in which there was also a great deal of visibility for the BNP. We explore the visibility of far-right parties in some more detail through the following maps, which display total number of references to the BNP and the UKIP (this time not compared to any of the other political parties). These maps seem to indicate that there is not always a greater total number of references to the BNP or UKIP in places in which they scored highly in the first two maps. In some places, such as West Gloucestershire, it could simply be that there are fewer online references to any of the mainstream political parties. 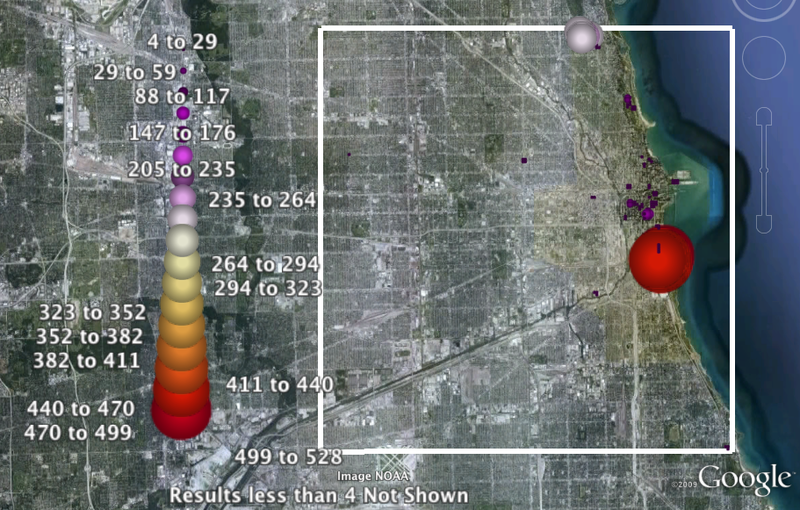 Are these maps predictors of election results and likely voting patters? We doubt it, but it is nonetheless interesting to observe the very unique geographies occupied on the Internet by different segments of the political spectrum. We will, however, claim any credit for correctly predicting an election result of 61% Tories, 33% Labour and 3% Lib Dems. 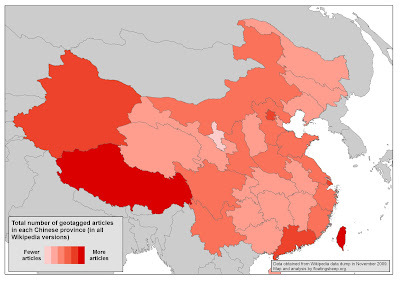 This post takes a more detailed look at the geographies of Wikipedia in China. Drawing only on the Chinese Wikipedia, this first map aggregates all geotagged articles at the provincial level. The pattern is similar to what one might expect. A larger number of articles in Taiwan and the prosperous eastern provinces than than in poorer Western China. 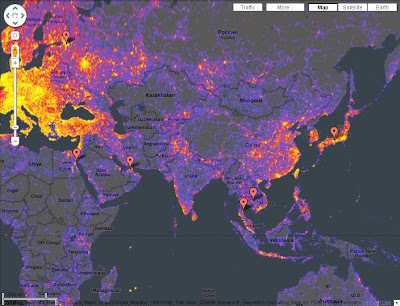 What is interesting though is the shift in pattern if we look at the geographies of all geotagged Wikipedia articles in all languages. Here we see a radical shift in focus. Eastern provinces retain a relatively large number of articles, but it is Tibet and Xinjiang that really stand out. Is this because non-Chinese wikipedians are far more interested in writing about the two autonomous regions than their Chinese speaking counterparts? It has been demonstrated that there appears to be a correlation between the locations of contributors and the topics that they write about. 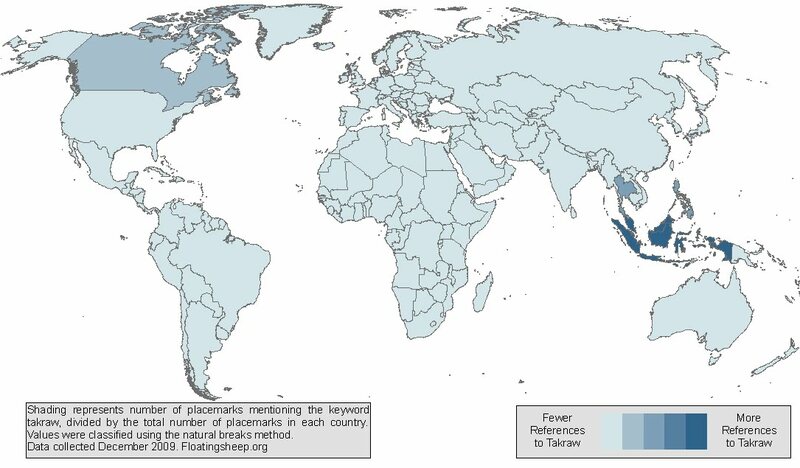 The fact that most Chinese Wikipedians are from eastern provinces would then seem to explain some of the differences between the geographies of Chinese Wikipedia and all other Wikipedias. Or can we attribute these differences to either self- or government-censorship? There have certainly already been convincing claims made to that effect. We plan to revisit this topic at regular intervals in order to map any possible spatial shifts over time. We would also appreciate any comments that help us to shed light on this issue.